When divers socialise and the talk turns to big, high-adventure dives, you can count on deep diving to come up. Take the challenge and add some depth to your Thailand diving adventures! South Point is a rock pinnacle just off the Racha Noi Island coast near Phuket - Thailand, that rises abruptly from the bottom at about 45 metres. It rises to within a few metres short of the surface, and since it's out away from the island, it usually enjoys clear water flowing in from the north-south Andaman Sea current. You and our buddy jump in to better than 30 metres of viz. in the waters around South Point and descend through schools of unicornfish and surgeonfish to a ledge near 35 metres. You are both trained in deep diving. From your vantage point you can see all the way down to the sandy bottom 15 metres below and the surface, shimmering overhead. After a moment to fine tune your buoyancy and adjust your DPVs (Diver Propulsion Vehicle scooters), you take off in a staggered formation, scootering all the way around the pinnacle, following a gradually ascending profile. Giant trevally rush about you as you fly through the crystal-clear water; a school of blacktail barracuda check you out before spiralling away in to the blue. You reach our safety stop as planned, and hang out for 5 minutes, watching in awe as a manta ray feeds glides past, feeding near the surface. You clamber back on board the Phuket dive boat elated. It's one of those memorable moments of diving in Thailand when the conditions, gear and companionship come together for an amazing experience. If the idea of deep diving excites you then take the PADI Deep Diver Specialty course. You'll learn how to manage the added risk that comes with deep diving, and how to be prepared for emergencies and errors that can happen. You're likely to find it a rewarding challenge that helps you grow as a diver. And, that's a thrill - the good kind! The reason PADI Deep Diver training is important is that our margin for error narrows with depth. That's not really an issue provided absolutely nothing goes wrong and you make no mistakes. As we go deeper, we use air faster and have shorter no stop limits. The surface is much farther away and harder to reach. Scuba accidents usually result from, not one, but several errors that link into a chain leading to disaster. On a deep dive, that chain is very, very short. Conditions, combined with depth, also affect your risk. 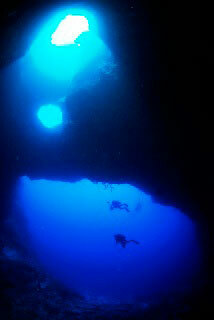 In recreational diving, we define 'deep' as 18 metres or 60 feet to no more than 40 metres or 130 feet. But, 30 metres in warm, clear water can be a breeze compared to 12 metres in a cold, low-viz current. So, training as a PADI Deep Diver sometimes pays big dividends on surprisingly shallow dives too. Boat Dives: 5 (not the standard 4 dives!) - You choose the dive sites from Racha Noi, Phi Phi Islands, Shark Point, Kingcruiser Wreck, Anemone Reef - we'll take you to as many different sites as possible. Note: 4 dives are part of the course, and you get 1 extra 'fundive'!